This is the latest installment of the Collegebaseball360.com Two Sport Report. We are updating the progress of college baseball players who also play sports like football, soccer and swimming. We have added a couple new players to the list as well. If you know of someone not on the list shoot us an email and let us know: editor@collegebaseball360.com. While Shinskie is not a college baseball player, he is an interesting two sport athlete. Shinskie is a 25-year-old freshman who is starting at quarterback for the BC football team. He has passed for 1,503 yards with 12 touchdowns and 9 int. so far in 2009. He guided a 70 yard touchdown drive, capped by a one yard sneak to give the Eagles a 14-10 win over Virginia on Saturday. The wins keeps BC’s ACC Atlantic Division title hopes alive. Shinskie was drafted in the fourth round of the 2003 MLB draft by the Minnesota Twins, and he finished his minor league baseball career in 2009 in the Toronto Blue Jays organization. He is not eligible to play for the BC baseball team. Collaros batted just .204 in 49 at-bats in 2009 for the Bearcat baseball team. However, he has had a much bigger impact this fall for the UC football team. Collaros has completed 75- percent of his passes for 1,434 yards with 10 touchdowns and two interceptions for the unbeaten Bearcats. Cincinnati sits atop the Big East standing, and is ranked fourth in the most recent BCS standings. Parker graduated high school a semester early to enroll at Clemson in January 2008. He’s a redshirt freshman on the football team, but he will be a junior on the baseball squad in 2010. Parker has completed 134 of his 252 pass attempts for 1,665 yards with 14 touchdowns and 9 interceptions. He has helped lead Clemson (7-3, 5-2 ACC) into the Top 25 in 2009. A win over Virginia on Nov. 21 would clinch the ACC’s Atlantic Divsion for the Tigers. This season Riddle became the Southern Conference record holder for career completions and passing yards. For the season Riddle has completed 65-percent of his passes for 2,758 yards with 21 touchdowns and seven interceptions for the Phoenix in 2009. Elon (8-2) finishes the regular season Saturday at Samford. Riddle ranks 8th in passing yards and 17th in pass efficiency in the Football Championship Subdivision. Nathans started 10 of Fairfield’s 17 soccer games and totaled three points in 2009. Nathans started all 47 games for the Fairfield baseball team last season, and led the Stags with a .377 average with a 1.006 OPS. Nelson is Hofstra’s second-leading receiver with 28 catches for 352 yards and three touchdowns through nine games in 2009. Dornfried has hit 6 of 8 field goals and 34 of 35 extra points through the Crusader’s first six games. He converted all four extra points in Saturday’s 28-26 win over Lafayette. The win clinched the Patriot League title & gave Holy Cross (9-1, 5-0) the league’s automatic entry into the Football Championship Subdivision playoffs. Adams is a true freshman who was a high school quarterback and is now making the transition to receiver in college. Kolton Browning-6’2-181-Fr. – Football: QB & Baseball: Pitcher. Browning is a true freshman that is a back-up quarterback on the football team and is expected to pitch for the Warhawk baseball team next spring. Like his former LSU teammate, Jared Mitchell (drafted and signed by the Chicago White Sox), Jones has both a football and a baseball national championship ring. Jones is LSU’s fourth leading tackler with 59 takedowns along with two interceptions. Jones is also averaging 21.5 yards on six punt returns, including a 93 yarder for a touchdown vs. Mississippi State. Peterson has 37 tackles, three sacks and an interception in the Cowboy’s first 10 games of 2009. He batted .366 with 16 stolen bases in limited action on the diamond last spring. Bronson leads McNeese (8-2) with 68 tackles in 2009. He also has two interceptions. Decker entered the season on the Biletnikoff Award Watch List. The award is given to the nation’s top receiver. He started Minneosta’s first eight games, but suffered a foot injury and is out for the remainder of the 2009 season. Although he has missed the Gopher’s last three games, he remains their leading receiver with 50 catches for 758 yards and five touchdowns. Rust is the Aggie’s third-string quarterback and he plans to play baseball next spring as well. He would be just the second athlete to play both football and baseball at New Mexico State. Hughes has recorded 33 tackles with an interception in the Colonel’s ten games. Wilson is a redshirt sophomore for the football team, but he will be a junior on the 2010 Wolfpack baseball squad. He has completed 58-percent of his passes for 2,534 yards with 26 touchdowns and ten interceptions. Wilson has also rushed for 319 yards and four touchdowns through seven games. Maust has averaged 35.8 yards on 19 punts in 2009. As the holder on ND’s field goal team he completed a pass to convert a first down on a fake FG vs. USC. He was an All-Big East pitcher in 2008.
team’s scout team player of the week for his impersonation of Nevada QB Colin Kaepernick prior to ND’s 35-0 win. 2009 was Sharpley’s last season with the Irish baseball team. He was picked by Seattle in the 50th round of the June MLB draft. Sharpley batted .333 with 7 HR, 29 RBIs and a 1.043 OPS for the Mariner’s AZL Rookie League team. Tate is a semi-finalist for the 2009 Biletnikoff Award. He is ND’s leading receiver with 74 grabs for 1,172 yards and 11 touchdowns. His 1,172 yards are the fourth most in the nation, and he’s 18th nationally in all-purpose yards. Tate has also rushed for 159 yards and two TDs. He returned a punt 87 yards for a touchdown vs. Pittsburgh. Alfreno was 1-0 with one save in 20 relief appearances in 2009 for the Nittany Lions baseball team. Steve Tedesco-6’1-195-Sr. – Football: WR & Baseball: IF Tedesco is Sacred Heart’s leading receiver with 67 catches for 865 yards and 11 touchdowns this season. His yardage ranks 14th in the Football Championship Subdivision. He is the Sacred Heart (2-8) school record holder with 37 career touchdowns. Tedesco had a career day with 12 catches for 144 yards and four touchdowns in the Pioneer’s 45-42 loss to Duquesne. Heart baseball team. He’s the football team’s back-up punter. the first player in the 45-year history of the USA baseball program to play football and baseball. Gerhart is one of ten semifinalists for the Doak Walker Award, which goes to the nation’s top running back. He has the third most rushing yards in the nation with 1,395 yards with 19 touchdowns in 2009. On Sept. 26th he rushed for 200 yards and a TD in Stanford’s win over Washington. 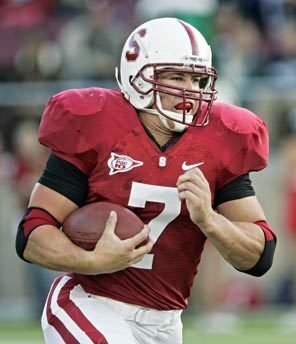 On Nov. 7th he topped his own school record with 223 yards in a 51-42 upset of then #8 Oregon. He also ran for 178 yards and 3 TDs in a Nov. 14th win at USC. He is the first Cardinal back since 1988 to have a 200 yard rushing day. In 2008 Gerhart was an outfield starter for Stanford’s College World Series team. McVaney made 12 relief appearances as freshman for the 2009 Bobcat baseball team that made it to the NCAA Tournament. The fullback has four carries for nine yards through in 2009.
redshirt freshman in 2009 he led the baseball team with a .346 average. Szczur was a 38th round draft pick by the Los Angeles Dodgers out of high school in 2007. 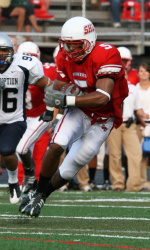 He has 33 catches for 335 yards and four touchdowns for the Wildcats (9-1) in 2009. Szcur is also averaging 28.8 yards on 19 kick returns (including one for a touchdown) this season. 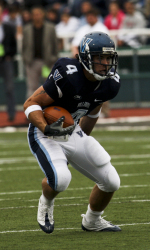 As of Nov. 14 Villanova was third in the Football Championship Subdivision national rankings. baseball roster last season. He pitched in two games in relief. Miles is a highly-touted freshman in both sports. He is currently low on the depth chart for football, because the team is deep at the wide receiver position. Bennett had 8 punts in four games in 2008 for the football team. During the 2008 baseball season played in 25 games with 14 starts and hit .298 with 17 hits and 8 RBIs.